Due to increase of the population affected by Coeliac disease and awareness of consumers about the relationship between food and health, the production of cereal products from raw materials other than wheat is of interest. The aim of the work was to produce good quality gluten-free spaghettis, based on sorghum, amaranth and maize flour. Response surface methodology was applied to determine optimal formulation for the production of pasta. The resulting products of the experimental design were characterized regarding humidity, color, density, water activity, texture (firmness and elasticity), optimal cooking time, cooking weight, and cooking loss. The main trials were compared to two industrials gluten-free spaghetti. The results showed that water activity and cooking weight of the main trials were similar to the industrials pasta, but were really different for the other studied parameters. The optimal formulation was determined in order to obtain pasta with low cooking loss and optimal color and texture firmness. It utilized 12% egg white, 60% maize flour, 30% sorghum flour, 10% amaranth flour, 2.4% guar gum and 36% water. The optimal formulated pasta was evaluated by an untrained consumer panel in a sensorial analysis to show the consumer acceptance. The product presents nutritional benefits, the color was appreciated, but the texture was granular and crumbly which was not liked by the consumers. 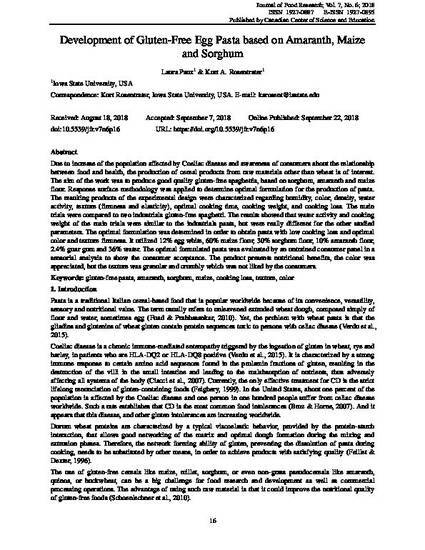 This article is published as Paux, L., and K. A. Rosentrater. "Development of gluten-free egg pasta based on amaranth, maize and sorghum." Journal of Food Research 7, no. 6 (2018): 16-36. DOI: 10.5539/jfr.v7n6p16. Posted with permission.